If you’re an avid dog-lover like us (and we’re guessing you are … you are reading this blog after all), you want to do the very best for your canine family member especially with their food and treats. 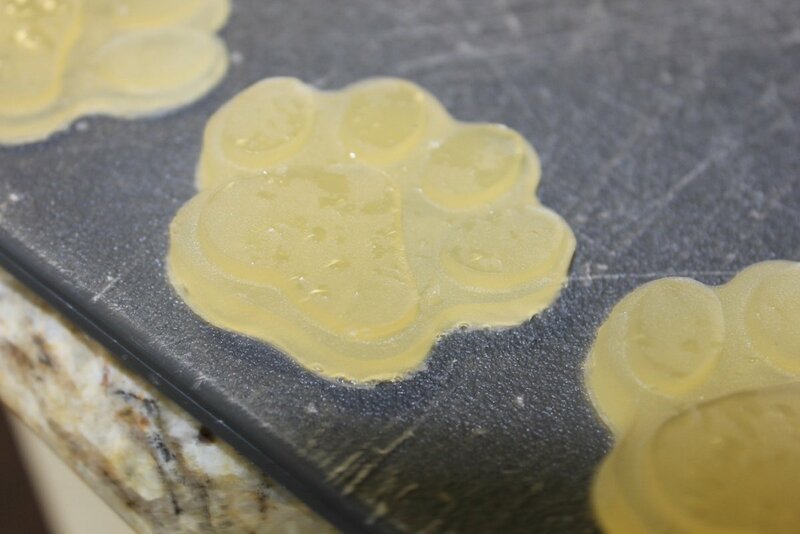 So, when we saw this yummy, gummy paw treat recipe on PuppyDogPro, we just had to share (because sharing IS caring)! With just TWO ingredients (what’s NOT to love about that?! ), this simple, easy and healthy treat is a dream come true … for YOU and your dog! In a small pot, bring the stock to a boil. Remove the pot from heat and let it cool for 3 minutes. Whisk in gelatin until no clumps remain. Let the liquid cool off for a few minutes and pour into molds or ice cube trays. Serve treats when they are solid, but jiggly (like Jello). Store treats in the refrigerator for up to two weeks. Want them to last longer? You can freeze them for a couple of months. Nice! Looks like something to treats the kids with soon! Thanks for sharing. Enjoy! Ridiculously easy … gotta love that! Is gelatin safe for dogs ? Absolutely! But, make sure it’s “unflavored gelatin” (like Knox Original Gelatin) … NOT “Jello” that has colors, tons of sugar and unwanted preservatives. Specifically, gelatin contains valuable amino acids beneficial for a dog’s skin, hair, and joint health. It may also potentially help control seizures (canine epilepsy) in dogs.Gelatin can also help address arthritis and hip dysplasia. And of course, we ALWAYS recommend getting your vet’s advice relative to YOUR dog when deciding on frequency and volume of any supplement. There’s more information AND great recipes at: http://moderndogmagazine.com/gelatintreats. Thanks! Please share with YOUR friends with dogs!